In several interviews, Dave Arneson said that when they began developing the Blackmoor campaign he dropped the Chainmail combat system for various reasons and adapted a system he had developed for a naval combat game called Civil War Ironclads. I don't know, but the impression I get from various web posts is this is a game that never saw print, but the rules may have circulated in some of the local clubs. Apparently the 2-9 AC or maybe a 1-10 AC was part of the the Civil War Ironclads game. Is there anybody out there - original Blackmoor players, twin cities wargamers, Zeitgeist folks, Arneson family, anybody - who has a copy of these rules or could shed any more light at all on them? <sigh> I'm still hoping someone will turn up a copy of Civil war Ironclads, but in the meanwhile I'll offer some speculations and hope for commentary. 1) a to hit roll is made”In the normal fashion” against an armor class rating (as adapted from Civil War Ironclads according to interviews). 2) Players, if hit, attempt a saving throw (versus dexterity?) to avoid damage, monsters get no save. 4) hit points are a fixed number between 1 and 100, but for Fighter, the saving throw versus damage improves as characters level up. Okay, I’m pretty sure there was no thaco and d20’s in the original blackmoor system (1972-73) – that must have come later, but there are important clues here. Now, Greg Svensons in his Interview with Sham said “Attributes were different, we had used two d6’s to get a number from 1 to 10,”. 1) Using 2d6, the attacker must generate a number from 1-10. If this number is less than the AC (ranging from 2-9 as per OD&D) of the defender a hit is scored. 2) If the defender is a player character they may attempt a saving throw (probably versus dexterity) to avoid getting any damage, otherwise, or if the save is unsuccessful, roll for damage. 3) Damage is rolled using 1d6, unless otherwise specified and the result is subtracted from the hit point total. 4) At 0 hp death occurs. Now there is a couple of things I don’t quite get. First, how exactly, do you get 1-10 using two d6’s? Is there an old wargamers method for this? The second regards extra dice for leveling up. We know there were three levels flunky, hero, superhero. What I wonder is if hero’s could roll 4d6, and superheros 8d6 or some such, perhaps patterned after chainmail, and perhaps monsters likewise could roll extra d6 depending on their HD? What do you think? P.S. A last thought is that at some point according to the FFC, Arneson also added the hit location system, close to that which appeared in the Blackmoor supplement, and a height differentiation system. I was wondering if the Sup. II Assassin killing's stable was not, far or less, linked to Arneson's fighting system. It would rather fit. I was not aware of the tie to the Civil War Ironclad rules until much later and never saw those rules. Greg Svenson, aka "The Great Svenny"
This all goes back to the notion that the AC was in some manner directly rolled against on 2d6, and whether you are subtracting two or not changes the odds but not the basic process. I always thought that rolling 2d6 at or below AC made sense, so (for example) AC of 9 would be hit on a 2-9 whereas AC 2 would only be hit on a 2. Subtracting two on the roll is just like adding two to the AC, so no armor would morph into 11 on 2d6 (hit on 2-11) while plate & shield would morph into 4 (hit on 2-4). Seems like it would have been easier to adjust AC instead of adjusting die rolls with each combat. - any creature can be killed in a single blow (like Conan killing a dinosaur with spear, or "even the might Smaug could fall to a single arrow in the right place", FFC). - Heroes don't gain HP, but have more chance to parry / dodge hits. - Combat is dealed differently according to its importance ("only in the man-to-man level were all options thrown in, FFC). On that point, I fully agree with Jason that the various Chainmail combat could apply according to the situation. Even if we can't recreate fully Dave's system (and it evolution! ), I guess these are some guidelines which should be kept in mind. Me too actually. But we do know that ability scores were used for saving throws - its in the FFC - and that they were 2d6, and that they ranged 1-10 as reported by Mr. Svenson. So if we can take Daves statement as reported by Mr. Lionhart that "This method of attacking corresponded to your ability and skill rolls" as a genuine insight from Dave, then the conclusion via reverse engineering, is inescapable. Combat throws must have followed the same 1-10 mechanic as ability scores. In fact, I would bet that saving throws were just an expansion of the combat system. Armor Class then is kind of the first saving throw - and the only one monsters got. Now why would Arneson want any rolls to be 1-10 instead of 2-12? I dunno. Its seems really curious, in fact the first time I saw it I thought it was a typo, but there you have it. My only guess is, knowing Arneson liked percentile dice, that he simply preferred a system based on tens, maybe with the idea that it could be expanded more easily. AIF was all percentile dice based. Maybe somebody has a better idea of why a 1- 10 range would be useful? The main problem to solve was the mathematical progression with higher levels. Yeah that's true. Arneson handled that with increasingly better saving throws vs damage but I'm not sure how far you can take that before the character becomes nearly invincible. On the other hand there were only 3 levels in early Blackmoor so for him it wouldn't have been much of a problem. Thanks Snorri , Actually I'm very confident that what I've posted is what Arneson was doing - at least at some point and only as far as it goes. Its that evolution thing that screws the pooch. Its like trying to catch a waterfall. Arneson was always adding, changing and experimenting so there is no way to capture all of the details of what was tried in those early Blackmoor games. Did he always do 1-10 for combat or did he try 2-12 for a while? How about that hit location system? When did that come in? And then there's the whole negative AC for ghosts that Lionhart mentioned, and that's just the stuff we know about. Oh, BTW Snorri, your mention of the assasins table was intriguing. Any more thoughts on that? Not being familiar with Dawn of the Emporers I dutifully googled it and nearly fell out of my chair when I saw Havards avatar starring back at me. Ha! and I always thought it was a self portrait.... Anyway its interesting that Arnesons ideas seem to be echoed elsewhere. When I get some time I'll take a look at the hit location stuff in Supp II and AIF and see if I can make sense of how that might fit, but it would be great to hear some more voices chime in on this. Regarding the 2d6 for 1-10 scores, they might have been using averaging dice. These dice are numbered 2-5 with an extra 3 and 4, instead of 1 and 6. Doesn't really explain it but it does raise some questions. Another idea may have been acontrol die and a standard die that determined whetether you rolled a 1- to 6 or 7 to 12. The 2d6 for combat makes sense. It also makes that +1 to hit with missles a little more interesting. 2d6 - 1 treat 11 as 10 weights both ends of the probablity scale and gives a result of 1 - 10. I'd never considered the use of averaging dice, and honestly I can't recall the first time I ever encountered them so I don't know if they would have been used prior to 1974. 1. Averaging dice would give more of a 4-10 range, which I can't quite fit together with the 1-10 we're looking for. 2. I wonder if it's possible that Dave used chits in a cup (cardboard randomizer squares with numbers on them) instead of dice. I never heard anyone suggest this, but it would allow any number range desired and it was used in some wargames prior to 1974.
character's missile ability and speed with actions such as firing first, getting off a spell, etc." things as the number of hits which can be taken and how well the character can withstand being paralyzed, turned to stone, etc. I guess the descritpion has been taken from Dave's mansucripts, but Gary choose to use his own saving thrown system - which is part of the "alternative fighting system". The use of d100 seems to have been early in use in Dave's game. It makes the FFC system looks close from a proto-Runequest : parries, close hit points, localisation... that's among reasons I suspect also the assassin table (wich looks closely to the RQ universal opposition table) as a good way of handling fights, as it take in consideration the level of both opponnents (but keeps the probleme of AC out). In this case, the basic formula could be something like 50% + (5xattacker's level) - (5xdefender's level). I'm going to have to dust off Dave's Adventures in Fantasy rules again. As this thread grows more complex it sounds a lot more like those rules. Funny how folks give Gary credit for being complex, what with some of the post-AD&D games he developed, but no one seems to recall the fact that Dave's ceations seem to be much more forumula-and-mathematical in nature. I sit and read some of the examples in FFC and say "huh?" when I'm done. Yeah, that's a paradox isn't it. Arneson's philosophy was always rules be d**ned, its Role play not Roll Play, and yet he seemed to love to experiment with complexities like all the divide by formulas in AIF, the random disease charts in Supp II and Pegasus mag and the hit location charts. Complex man I suppose. At least he was never wedded to those ideas. Like with the hit location charts - he later said he quit using them because he said they slowed things down too much. Snorri that is an excellent bit of archeaological detection work! I bet you are right about that wording coming from Arneson since Gygax seems to have accepted Arnesons abilities as they were in Blackmoor except changing the score to 3d6 and changing Appearance to Charisma. I see now what you mean - the Assasins table being one of the early ideas of how one could handle combat. Hmm. lots of possibilities there... Might work well for those trying to set up games where armor doesn't really exist, like Barsoom games. attack roll = [attack score - defender's level], roll 1d20 under. So a 4th level character attacking a 1st level creature has got 10+4-1 = 13 to hit. For defence, use the same roll for characters only . Very pulp : the characters defends very well, their opponents die quickly. I will tinker a way to deal AC and damage more effectively, but I got some ideas. attack roll = [attack score - defense roll], roll 1d20 under. Snorri has just reminded me of a interview with Arneson odd74.proboards.com/index.cgi?board=blackmoor&action=display&thread=2893&page=2 where he briefly discusses using percentile dice in early Blackmoor. (see the % archaeology thread) When I posted the initial hypothetical recreation of Arnesons combat system I was working under the idea that it was likely he was only using d6’s. However, knowing he had percentile dice at his disposal and was using them “from the start” opens up several possibilities. Specifically it explains why Arneson may have wanted to use 2d6 to generate a 1-10 range. 2d6 gives a bell curve, but translating it to a 1-10 range allows the use of a random 1d10 for checks. Similarly, 1d10 (or, as the case apparently was, a d20 numbered 1-10 twice) could be (and I think probably was) used as the “to hit” die for combat on a roll under 2-9 AC instead of 2d6 converted to 1-10. This seems to be the best fit for the facts we have so far. A further point of correspondence is the report by Mr. Lionhart where he says “Thaco is about rolling under, not equal or under”. If the attribute range is 0-10, then you can generate it easily with 2d6-2. That has the advantage of simplicity, and if you're trying to roll over or under the attribute number that range translates to 1-9 plus "always under, never over" and "never under, always over" which has some attractive possibilities. I think the 2-9 range of ACs in OD&D makes sense in this context too. The "kill the monster in one blow", which is possible in Chainmail, but quite difficult in OD&D, fits the pulp literracy - where it's a common feature. And, Dave is right to says the players don't want their character to suffer the same trouble - pulp heroes don't die so easily. What is interesting is that Blackmoor's combat is disymetric: rules which applies to PC's don't allways apply to their foes. Very mportant, as D&D is an almots symetric game (and goes to perfect simetry when it apply to NPC's). The disymetric games came back very later, with all cinematic games which put emphase on the Heroes and makes different categories of foes, like in movies (small goons, big boss). So, searching for the Blackmoor combat means searching for the first disymetric game - a very modern one, in fact. Good point. Although I don't interpret the above quote to mean that after player characters got HP, the monsters remained without them (remember that players were often playing monsters too). I think he assigned hp's to both, but the human classes were definetely given a number of advantages monsters didn't get. Fighters got saving throws to avoid damage and they could get extra attacks if they killed thier opponent. The sense I got from Arneson's seminar at Gen Con '08 was that having monsters played by PCs faded out as a regular feature of the campaign quite early (despite temporary exceptions like assigning a monster to a kid or the player of a PC who had just died). I wouldn't find it surprising if much of the evolution of the combat system happened after that shift in gameplay. We used 2d6, but we were doing individual combat on the first adventure and we changed very rapidly to something far more like the alternative combat system within the first month of play (this would be in January of 1971). So, it was something in between. If we needed specific probabilities we used 3d6 (a couple of us were math majors and could figure out the dice rolls needed to get any specific probability). I did not see a d20 before the brown box came out. I actually never played Braunstein. So I think where we end up is that Arneson probably used the 2d6 for combat rolls at times and d20 at times, possibly on the sly (behind a screen?) and when Greg reffereed it was all 2d6. We didn't make "the jump" from Chainmail at all. Chainmail was useful for large groups, or armies, fighting; but it proved to be worthless for what was needed in fighting man to man in Blackmoor. We had experience in man to man combat from other games (like Braunstein). If you look at combat between single planes or ships in games from that era, you will see that Blackmoor had much more in common with them than Chainmail. Chainmail was only used for larger battles between groups of non-player characters for convenience. Still struggling with the FFC hidden clues. p. 30 "Sir Fang. 3, AC 2, 40, 32, 35 HTK"
Why does sir Fang has 3 sets of hit points? p. 31 "3 Conjurers: AC 5, 9 HTK; AC 5n8 HTK; AC 1,7 HTK;"
AC5? Do they wear a chainmail? All magic-users have AC from 6 to 1.
p. 31 "11 Warriors: AC 1.4 HTK (...)"
Several others mentions of AC1, without mention of magic armor. p. 31 "13 Swashbucklers "Stone Guards": AC 5, 5/19 HTK"
Same remark as for Sir Fang. Why two sets of HP? On the same pages, some other monsters also have two sets. p. 32 "7 Swashbucklers: AC 4, 5/19 HTK, Armor +1, Shield +1"
Here's a mention of magic armor, but unclear if one wears it. No apparent effect on AC. p. 33 and after, Dave switch to another system, apparently different (and maybe older), where he don't give such stats. - AC ranks from 8 (bad) to 1 (good), as far as I can see (please check if I'm right). - Some monsters and humans apparently have several sts of HTK (HP) for a reason I stil can't explain. Any thoughts? In this case, I think the answer may lie in the nature of the monster. Vampires are capable of taking several forms, bat, wolf, fog, etc. and I think that this may be Daves notes on the HP's for various forms. Magic users in chainmail? Probably so. Arneson always had a freeform approach - most of the now familiar class and race restriction crapola (pardon my French) came from Gygax. The AC range of 1-8 is very interesting though! It is indeed smaller is better, with 8 being the Armor class given for a Gelatinous cube (as it normally is). Of course we don't know when these notes date to, but they do have a pre 1974 feel to me. First it sounds a lot like a range from a naval game "1st class armor plating" and all that. Second, as far as I know, there is no AC1 in OD&D and no reason for it to show up multiple times in the first 6 levels of Blackmoor dungeon - the original levels btw. Third, A 1-8 AC range also fits well with the roll under system, if, and only if Arneson is using a 1-10 die range as we have speculated he may have done using the AIF match or roll under method. 2d6 would obvioulsy not work as the attack die nor would the "not equal or over" system mention in the Lionheart piece. Since he is talking about Thacos in that piece, Dave had apparently translated his earlier match and roll under to the Thaco target numbers and in the process made it stricly roll under, not equal or under - a small point but we have only snippets of evidence to work with here and I'm being careful to see that there are logical explanations for apparent inconsistencies. In any case, AC 1-8, match or roll under with a d10, fits Arnesons statement that the method of attacking "corresponded to you other ability and skill rolls", known to range from 1-10 and to have been used as checks in a roll under system. Fourth, it is the same amount of numbers as 2-9, but allows a greater chance of missing 20% even the worst AC. The guards here and the other monsters don't have two sets of Hp (Htk) 5/19 appears to represent Hit dice/Hit points. The hit dice being a d6. If you look down through the list and you multiply the first number by three (average value) you will see they often come close and never fall outside of the d6 range. This may relate to the +'s being important when fighting undead with negative armor class as mentioned by Lionheart. Looking further ahead to the entries for levels 7+ of Blackmoor dungeon, I'm struck with the sense that they are just more incomplete, but their is a mysterious number in parenthesis in following most of the monsters - numbers like (40), (35), and several cases (150). Perhaps some reference to your percentile system? will have to give this a closer look. You're probably right about the HTK system, Aldaron. I wil have a closer look, but apparently it fits perfectly the OD&D system Title / Hit Dices / Hit points. The 1-8 AC range fits exactly the Chainmail Man-to-Man list, with 8 possibilities (+ 2 for horses barding). So probbaly the switch from 1-8 to 2-9 was from Gary, maybe for the magical weaponry issue. As in FFC a hero could learn magic from a wizard (and, as I said in the "swords for clerics thread") a Evil Priest is a Sorcerer, the wizard in armor makes sense. In Chainmail, after all, they're linked closely to heroes, fight as armored men and some extraordinary figures like Elric could be biclassed. I suspect the first version of Blackmoor had only fighters, wizards being foes - then heroes learned magic. - Probable use of table / matrix rather than a formula, in a wargame style. Just look the table of relative size of opponents in supp. 2 to see what I mean. 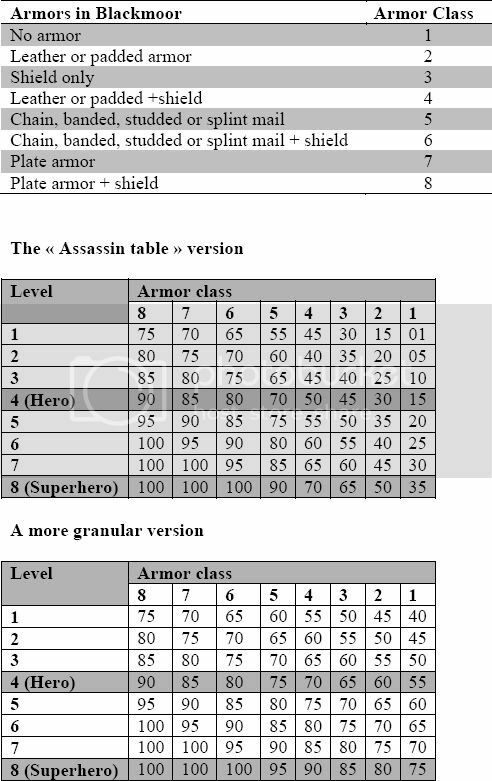 So, I crossed in a wargame-style a matrix with the 8 AC and 8 level from flunky to superhero, and provides two versions: The "assassin table" (from Supp. 2. Interestingly, there is a change of scale after 8) and a more smooth version with only 5% steps. What do you say of that idea, folks?